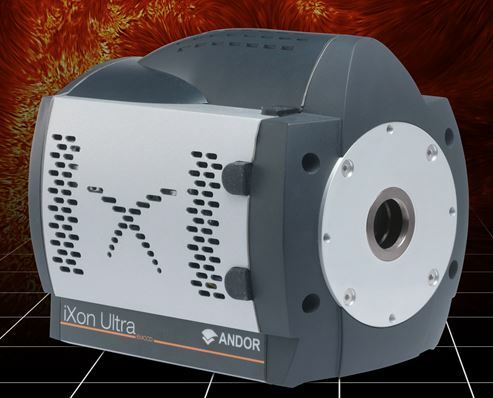 With the iXon EMCCD cameras, Andor have delivered a dedicated, truly high-end, yet accessible ultrasensitive scientific camera platform, designed specifically to drive the absolute best from EMCCD technology across all critical performance specs and parameters. The iXon Ultra 888 has been fundamentally re-engineered to facilitate a 3x acceleration of the pixel readout speed to an unprecedented 30 MHz, whilst maintaining quantitative stability, propelling the full frame performance to video rate. Furthermore, Andor’s unique ‘Crop Mode’ can be employed to further boost frame rates from a user defined sub-region, for example pushing a 512 x 512 sub-array to 93 fps and a 128 x 128 area to 697 fps. With a 1024 x 1024 sensor format and 13 µm pixel size, the resolving power, field of view and unparalleled speed of the iXon Ultra 888 render it the most attractive and versatile EMCCD option for demanding applications such as single molecule detection, super-resolution microscopy, live cell imaging and high time resolution astronomy. The iXon Ultra is designed to be the most flexible yet easy to use EMCCD on the market, optimizable for a wide variety of application requirements in a single click via the OptAcquire™ feature. Furthermore, signal can be quantitatively calibrated in units of electrons or photons, either in real time or post- processing. Patented, pioneering technology offers automated recalibration of EM gain, alongside anti-ageing protection. Crucially, the iXon brand carries an outstanding reputation within the industry for quality and reliability, brandishing an unparalleled track record of minimal field failures.